Naomi Watts in Bvlgari jewels. Photo by Frazer Harrison. I know Oscar talk seems like old news by now but I still wanted to do a roundup of my favorite jewels at this year’s Academy Awards. As a whole, I’m not sure I liked the looks in jewelry as much as last year’s, but there were still—of course!—some standout weep-worthy gems that caught my eye. Here they are, and once again I am looking at the jewels first, then the gowns, or the tux. I’m excited to say that, for the first time, I included a man in this roundup as well! Perfect colors on Naomi. Photo by Jason Merritt. 1. Naomi Watts in Bvlgari. Naomi has been absolutely nailing it on the red carpet for a few years in a row, thanks to her superb stylist Jeanann Williams, who pulls such great looks for her! This was my favorite look of the night—her magnificent Armani Privé gown in midnight and purple sequins looked wonderful with a stupendous diamond collar necklace by Bvlgari. They may have made her snake clutch as well (let me know in the comments if you know for sure). I loved her makeup too. I need that lip color, Rouge Envy, I saw on her Instagram page that it was by L’Oreal! The necklace was paired with simple (and huge) studs. Photo by Jason Merritt. Fantastic clutch and a closer look at the dress. Photo by Jason Merritt. This shows the flow of the dress. Love it! Photo by Jason Merritt. Naomi & Liev. They are so good looking together! Photo by Jason Merritt. 2. Cate Blanchett in Tiffany & Co.
After seeing Crazy About Tiffany’s I do believe we can expect to see more Tiffany & Co. gems on Cate for seasons to come! I loved these magnificent diamond earrings on her, as well as the starfish cuff. Love that Cate cut her hair! Photo by Jason Merritt. Tiffany & Co. cuff. Stunning! Photo by Kevork Djansezian. Earrings by Tiffany & Co. and look at the jewels at the sleeve cap! Photo by K. Djansezian. I also went crazy for her amazing seafoam green Armani Privé gown, with all the feathered and jeweled touches like the crystals hanging down from the cap sleeves. It seems that Cate cut her hair too so I think I have to include her in my Bob Hall of Fame, wavy edition! I love this shot showing the dress details. Photo by Kevork Djansezian. Photo by Frederic J. Brown/AFP. The back of the dress. Photo by Frazer Harrison. 3. Alicia Vikander in Louis Vuitton. Alicia Vikander, who took home an Oscar for Best Supporting Actress for The Danish Girl, looked so fresh and lovely in a yellow Louis Vuitton gown embellished with silver beads. The gown was paired beautifully with diamond Louis Vuitton earrings featuring their iconic four-sided floral motif. I like them more every time I see them! 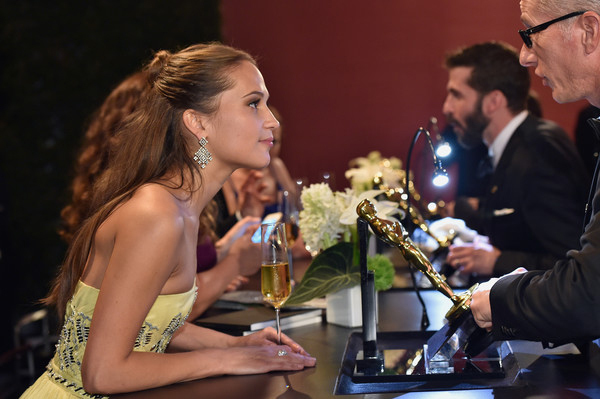 Such a great shot of Alicia waiting for her Oscar to be engraved! Photo by Kevork Djansezian. A really great photo of the earrings by Louis Vuitton. Photo by Frazer Harrison. I also loved that her dress allowed her to walk—some of these gals make me nervous that they may trip on their gowns—and I was especially crazy for the metallic sandals with gigantic Lucite heels. Love! A dress you can walk in! Photo by Ethan Miller. Love those shoes! Photo by Jason Merritt. 4. Saoirse Ronan in Chopard. Saoirse Ronan, a Best Actress nominee for Brooklyn, looked so beautiful and grown-up in her emerald green Calvin Klein sequined gown, a color specifically selected to celebrate her Irish heritage. I loved that she wore it with mismatched Chopard earrings of emeralds, pearls, and diamonds. There was not a lot of colored gemstones on the red carpet this year that I liked so these earrings were especially wonderful to see. It was a surprise to hear that Saoirse was actually born in the Bronx! All of the photos of Saoirse are by Kevork Djansezian of Getty Images North America. Saoirse Ronan in Chopard earrings. A shot with sequins and emerald and diamond rings! 5. Lady Gaga in Lorraine Schwartz. Lady Gaga earned my admiration awhile ago for the humor in her videos, along with her songwriting skills, general fearlessness, and that voice, my God, that voice! It’s always interesting to see what she wears and I adored that she donned gigantic Lorraine Schwartz emerald-cut diamond drop earrings featuring over 90 carats to the Oscars. Once again, like the baubles she wore to the Golden Globes this year, I can’t help but hope she owns these earrings and will trot them out every once in awhile so we can see them. I’m assuming she just borrowed them for the night but I would really love it if a star, whether an actress or singer, would start wearing their own amazing jewelry. Gaga has the money for these earrings so I hope she bought them for herself! Gaga in Lorraine Schwartz. Photo by Frazer Harrison. A shot with the earrings and her heart-shaped engagement ring. Jason Merritt photo. I thought it was great that she basically wore a strapless white jumpsuit with an overskirt to the show. This creation was made for her by her friend Brandon Maxwell. I like it! A simple jumpsuit with an overskirt! Photo by Ethan Miller. 6. Julianne Moore in Chopard. Julianne Moore looked very elegant in black lace Chanel accented with Chopard diamond earrings and a pavé cuff. The earrings sparkled like crazy when she was on stage to give out the Oscar for Best Actor (so glad Leo finally won!). Love the shape of these earrings on Julianne. Photo by Kevork Djansezian. A shot with both earrings. Photo by Jason Merritt. I found photos of the huge cuff on her wrist that I didn’t see during the show—I must’ve been blinded by all the glitter at her ears. I love that it takes up her entire wrist! I love this cuff against black lace. Hope the ring is her own! Photo by Frazer Harrison. The dress was by Chanel. Photo by Jason Merritt. 7. Common in a Diamond Brooch. I have been noticing more brooches on men both in street style photos and at awards shows and I have to say, I heartily approve! 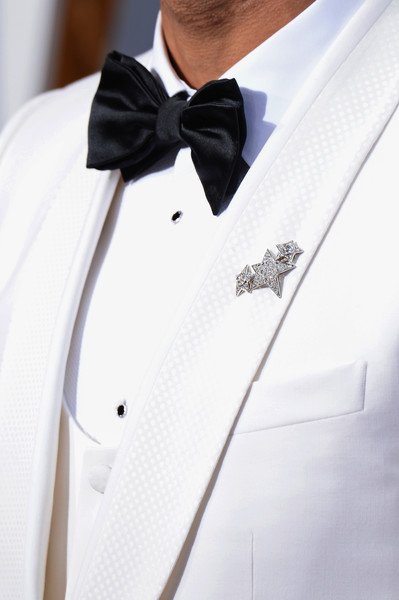 I loved that Common, last year’s Oscar winner for Best Original Song (with John Legend), wore a 3-star diamond brooch on the lapel of his Dolce & Gabbana tux. What an unexpected and elegant touch! Does anybody know who made it? Great diamond brooch on Common! Photo by Jason Merritt. 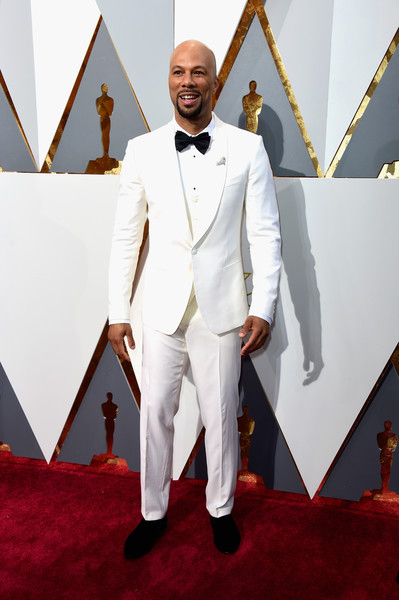 Nice to see a white tuxedo on the red carpet! Photo by Frazer Harrison. Thank God Frazer also got such a good detailed shot of the brooch! 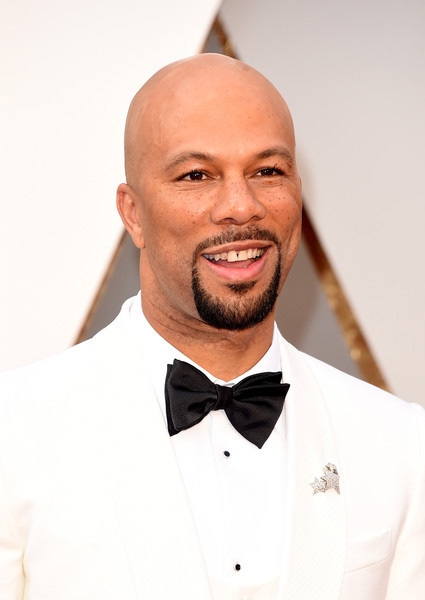 Let me know what you thought of any of these gems or gowns (or Common’s tux!). And let me know what other jewelry looks caught your eye! Once again I have to give an appreciative shout out to the hardworking men of Getty Images North America: Jason Merritt, Frazer Harrison, Ethan Miller, and Kevork Djansezian. They got great photos that we all love. Thank you, gentleman! Cannot wait for Cannes! Love that necklace that Naomi is wearing! She looks fabulous. It would be fun to have a diamond statement necklace...if I owned one I would probably wear it with my white tee and jeans...imagine the sparkle effect! Saoirse was my favorite of the night. Loved the dress and the mismatched earrings were so perfect on her. Her jewels were my favorite. But, Naomi's dress was AMAZING. And that necklace looked stunning with it! I love Cate's dress. I love feathers. That jumpsuit doesn't do anything for Lady Gaga's bust line.